• Former students at Riverhead High School have started a GoFundMe campaign to raise money for the family of Tanya Lawrence and her daughter Danielle, who were murdered Sunday night by Tanya Lawrence’s boyfriend. Danielle’s younger sister, Brandy, is a student at the school and her father, Riverhead physical education teacher Tony Lawrence, started the Riverhead lacrosse program. In one day, they’ve raised $20,150 for the family. You can donate online here. • The East End Arts Gallery is now accepting artist entries for their upcoming fourth annual national juried art competition and exhibit; this year themed “The Figure.” Guest jurors for this competition are Peter J. Marcelle, owner of the Peter Marcelle Project in Southampton and Kathryn Markel, Owner of Kathryn Markel Fine Arts in Bridgehampton. Selected entries will be included in the exhibition, scheduled to run from Aug. 7 through Sept. 23 at the East End Arts’ Gallery at 133 East Main Street in Riverhead. More information on how to enter is online here. 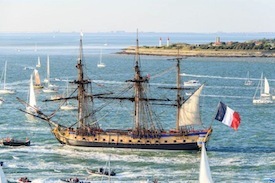 • The Hermione La Fayette frigate, an exact replica of the historic French ship that brought French general Marquis de Lafayette to the United States to help fight the American Revolution, is embarking in two months on her symbolic journey back to America, where she will be the featured ship at Greenport Village’s Tall Ships event over the Fourth of July weekend. The ship is departing on April 18 from Rochefort, France to the U.S. You can follow its 3,819 mile sail to the U.S. on the ship’s Facebook page. • Ever wonder where piping plover go in winter? The PBS NewsHour followed them to the Bahamas Tuesday night. The segment is available online here. • Winterfest begins tomorrow night at vineyards and venues on the North Fork. This weekend’s listings for the annual six-week music festival are online here. CAUTION SCAM on visit the vessel !!! The brochure is misleading. You are forced to take the tour with a guide (very expensive) if you want to visit the inside of the vessel. The brochure does not mention it. It is written in small print at the entrance and they don’t tell you if you want to an individual visit. Hi, Phillip, I’m a little confused by your message… the village had been planning to sell tickets to tour the vessels. I don’t believe there was ever a plan to give free tours. Is this different from the tour you are describing?